Up to 30 individual parts can be used to make a shoe. Shoe construction has hardly changed since the 19th century. Premium shoes are made of a number of quality materials. As such, they are high-quality overall products, ones that guarantee years of satisfaction for their owners. Depending on the particular production method used to make a given men's shoe, the shoe can consist of up to 30 parts. The phrase "shoe construction" truly refers to a painstaking, complicated process. 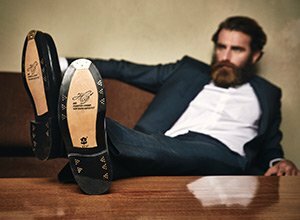 From the top lift to the toe cap, each component of a men's shoe is assembled in succession. Fundamentally, a shoe consists of two main parts: a shaft and a base, which are combined during shoe construction. That being said, premium men's shoes are really distinguished by a multitude of smaller details and reinforcements. Said details are what make premium men's shoes attractive for retailers and consumers alike. There is also some variation among different types of men's shoes. For example, a quality men's shoe with a smooth surface should ideally appear to consist of a single piece. The number of components involved in the shoe production process cannot even be counted at first glance. Harmoniously combined, they ensure perfect shoe fit. Wearing premium shoes also makes a valuable contribution towards maintaining healthy feet. Surprisingly, a look at shoe history reveals that the construction of classic types of men's shoes has hardly changed since the 19th century. If you are interested in learning how to correctly wear quality shoes, you ought to take a look at an overview of the currently-accepted dress code. Provided you are taking good care of your shoe leather , you can enjoy your men's shoes for a long time. Vegetable-tanned leather that is used to line the shoe. This leather should be soft and highly breathable; usually, calfskin or kid leather are used. During shoe construction the lining leather is stitched to the shoe upper from the inside of the shoe. A reinforced piece of leather that sits where the lining and outer shaft meet at the rear of the shoe. The counter serves as a continuation of the heel, holding the foot firmly in place within the shoe. A 1-to-2-millimetre-thick piece of leather that sits between the shoe upper and the leather lining. Provides the toe of the shoe with an elegant shape, preserves said shape, and protects the foot from forces outside of the shoe. These are the two rear pieces of the shaft that surround the opening of the shoe and meet the lacing at the front. A strap that is stitched onto the heel seam. Extends from the upper edge of the shaft to the bottom edge of the shaft. The rear strap conceals and reinforces the heel seam, and also serves as reinforcement at the heel. A strap that runs along the lining seam down the length of the shoe. Protects the inner lining seam and makes the shoe easier to put on. This strip of cowhide creates the supporting structure of the shoe. On average, the welt is 60 centimetres long and 3 centimetres wide. It holds the shaft, insole and sole together. Elastic material such as cork or felt is used to fill the hollow between the insole and the midsole. This material is known as the filler. Over time, the filler is moulded by the warmth of the wearer's foot as well as by his weight distribution across his foot, both of which lead to the formation of an individual footbed. At the same time, the filler muffles the wearer's tread and protects his foot from heat and cold. The bottommost sole layer on a men's shoe. Elegant models feature a sole that is about 5 millimetres thick. The outsole makes direct contact with the ground. The outsole is usually made of vegetable oak pit-tanned leather, which is particularly abrasion-resistant and waterproof. The outsoles on more affordable shoes, though, can also be made of rubber, synthetic material or wood. A roughly 2.5 to 3.5-millimetre-thick leather layer that extends from the toe of the shoe to the heel. The foot rests upon the insole—as a result, the insole significantly influences wearing comfort and the way the foot feels. Because of this, it is important that the insole be made of high-quality, vegetable-tanned cowhide. The shank is composed of the metal sheet and its cover, and is situated between the insole and outsole. It extends from the middle of the heel to the beginning of the front of the foot. In addition to supporting and guiding the foot, the shank preserves shoe form. This is a circa 10-centimetre-long and 1.5-centimetre-wide sheet of steel that lies in the hollow created by the welt and the insole, between the heel and the ball of the foot. The metal sheet is shaped to fit the curve of the sole and steadies the foot during wear, while simultaneously preventing the heel from wobbling. A soft leather cover that stretches over the insole. On the side facing the foot, the mid-outsole ought to be abrasion-, discolouration-, and perspiration-resistant. The length of the mid-outsole varies by shoe type— it can cover the entire length, three-quarters of the length, or even a mere quarter of the length of the insole. A piece of oak-pit-tanned leather cut out from the heel to ensure heel stability. This 2-centimetre-wide and 3-millimetre-thick strip of leather is nailed to the insole and outsole to serve as a foundation for the heel and/or insole. On Goodyear-welted shoes, the piping is held in place by wooden nails. On double-stitched models, the piping is held in place by stitching. The uppermost leather layer of the heel, which comes directly in contact with the ground, is known as the top lift. Made of leather, it often features an abrasion-resistant edge made of rubber or metal. Very occasionally, the top lift is made entirely of rubber. The leather used to make the shaft of the shoe, or the outside of the upper part of the shoe. Usually chromium-tanned and made from calfskin. Hiking and climbing shoes typically feature a cowhide upper. The upper is usually 1.2 millimetres thick. A roughly 4-centimetre-wide strip of a piece of the same leather used to make the upper that is affixed to the shaft between the upper leather and leather lining, and between the toe cap and counter. The reinforced toe puff prevents the leather upper from stretching out, and also guarantees a stable form on both sides of the shoe. The rubber ridge is a circa 2-to-4-millimetre-thick profile made of synthetic material that is added to the underside of the insole at a later stage of construction. On Goodyear-welted men's shoes, this is where the shaft and welt are stitched together. Hand-sewn shoes, on the other hand, do not have a rubber ridge. On those types of the shoes, the edge is directly worked out from the material of the insole, which is significantly more durable than that of their Goodyear-welted counterparts. Want to learn more about Goodyear-welted shoes and proper shoe care? 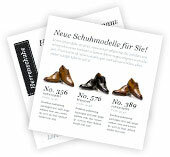 Subscribe to our free Shoeletter!